Are you looking for family holidays at Easter? On this page you’ll find some great ideas both in the UK and overseas, whatever your budget, whether you want a traditional celebration or an escape on a tropical beach. I have recommendations for families with children of all ages from babies up to teenagers. April is a great month to grab some early summer sunshine – the days are getting longer, the Mediterranean is warming up nicely, it’s a great time for activity holidays and it’s not too late to grab some late skiing. Or see my pick of the best self-catering holidays for families. Easter dates: in 2019, Easter Sunday falls late on 21 April. Easter is a wonderful time to be in the Med, particularly for families. Sunshine is almost guaranteed yet temperatures are manageable and humidity is low. And without the summer crowds, resorts feel more friendly as locals welcome the first of the season’s visitors. The only downside is that the sea water can be a bit chilly for swimming (fine for kids, not so great for mums and dads). If that’s an issue, stay somewhere with a pool. The further south in the Med you head, the better the chance of hot weather. Crete is a long way south and has some great places to stay including the Pendamodi villas which are set in wild countryside with a private pool and free hire car. At the luxury end of the market, Daios Cove has stylish family suites and an exclusive Scott Dunn children’s club for ages 4 months – 13 years. Cyprus is also a great bet. I like the Almyra which combines cool contemporary design with a beachfront setting and great facilities for young children. Puglia is far enough south in Italy to enjoy great weather at Easter. Check out this selection of hotels including the Borgo Egnazia, which has great facilities for children along with golf, watersports and spa for the grown-ups. The Ostuni Rosa Marina Resort has tennis courts, football pitches and children’s clubs for ages 4 – 17. Sicily is also a reliable bet over Easter – head for the Verdura Golf & Spa Resort which has a superb beach, free kids clubs, tennis academy, Juventus Camp football academy and bike hire. On mainland Greece, the Sani Resort is a superb collection of family-friendly hotels, particularly the Sani Beach Club and the luxury Sani Asterias Suites. In Portugal, the Algarve has very reliable weather in March and April. If you have a generous budget, you could rent a luxury villa such as Sto Estevao which has a contemporary design and heated pool and is close to a the surf beach at Tavira. You’ll find a great collection of coastal and countryside villas in Croatia many of which have a private pool. Check out the latest special offers. You can explore some of the 1,000 islands off Croatia’s beautiful coastline by chartering a boat from Sail Dalmatia. Don’t forget the glorious islands of Corsica and Sardinia. Check out this great selection of hotels, villas, apartments and residences on Corsica (and see the latest special offers). On Sardinia you’ll find excellent family-friendly hotels including Forte Village and Chia Laguna Resort. Does a Mediterranean cruise appeal? You’ll find some great ships packed with activities, kids clubs and interesting itineraries. P&O Cruises has some of the top-rated ships, Ventura and Azura. For value, it’s hard to beat Marella Cruises (formerly known as Thomson Cruises). A villa holiday is a great way for families to enjoy the Mediterranean. I recommend villas in the Greek island of Corfu, Paxos and Lefkada and charming Kefalonia where many properties are within a short walk of beach, shops and tavernas. Easter is also a good time to visit Catalunya in the north-east corner of Spain. There are some great villas in this region for families, or you could opt for the beautiful town of Sitges near Barcelona, where I recommend these villas. Also see the latest special offers. If you get away from the package resorts you’ll also find some lovely villas in Mallorca. See the latest special offers. If you want to treat yourselves, check out Sir Richard Branson’s new Son Bunyola estate in Mallorca which has just a handful of spectacular villas set in 680 acres of unspoilt countryside. You also get your own private chef, and a concierge. Or head to Ibiza where the stylish new Nobu Ibiza Bay Hotel has a sandy beach, spa, yoga pavilion, fitness centre and beach club. There’s also a free kids club for ages 4 to 14 with a great range of activities from cooking to DJing. Turkey’s Aegean coast is warming up nicely. Stay in a luxury villa with private pool or a family-friendly hotel such as the Kalkan Regency. If you want the best of both worlds, try Korsan Suites, an aparthotel. Or you could explore Turkey’s Aegean coastline on a small intimate gulet cruise. How about a self-guided family cycling holiday giving you and your kids the chance to explore a new region under your own steam with detailed maps and itineraries. Easter is a great time of year for this (it’s not too hot) and it’s great value. Your baggage is transported for you, and there’s a comfortable family hotel at the end of each day. Most popular destinations include Mallorca and Catalonia. You can find independent family walking holidays run along similar lines with popular destinations including the Catalan Coast of Spain and the Italian Dolomites. I’ve discovered some gorgeous family-friendly accommodation in Italy. The Borgo Scopeta Relais in Siena, Tuscany, is outstanding, and I also love this selection of agriturismi (farm stays) such as La Casella in the Umbrian countryside, which has a horse riding school, hiking, tennis and mountain biking. Or spend a few days exploring one of Europe’s great cities, staying in a family apartment. My favourites include a loft in Paris, a canal boat in Amsterdam, this stylish apartment in Lisbon and this designer home in Barcelona. Pharaohs, mummies, sailing on the Nile, snorkelling in the Red Sea – who can resist the eternal charms of Egypt? It’s only a five-hour flight and the weather at Easter will be perfect. With younger kids, go for the Classic Family Adventure while the Pharaohs Adventure for Teens works for ages 12-18. 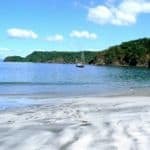 Jump on a direct BA flight to Costa Rica where you can enjoy zip lining, white-water rafting, canoeing, horse riding, surfing, active volcanoes and rainforest walks. This 10-day family trip will knock their socks off. If you just want to have fun in the sun, head to Dubai – it’s a six hour flight but you can expect temperatures of 30ºC and 9 hours of daily sunshine. It can be difficult to pick a hotel but for families I recommend the One and Only Royal Mirage – it has a great location, great kids programmes and facilities. For teenagers, go for Atlantis, The Palm or Jumeirah Zabeel Saray. The Sultanate of Oman has the same climate but more in the way of culture, history and adventure – from desert dunes to turtle beaches. Great hotels for families include the Al Waha and the Al Bandar. Even with just two weeks off school, you’ll have enough of time to take a dream trip in Africa. I love these malaria free safaris in South Africa and these family wildlife safaris in Kenya. One of the best family trips to South Africa is this 11-night Kwa-Zulu Natal which includes game drives to see the Big Five, plus orientation, bush tracking and a chance to learn about conservation, ecology and anti-poaching methods. Easter is a great time to visit the Caribbean but you need to pick your hotel with care. For families I recommend Round Hill Hotel & Villas in Jamaica. If you’re looking for a value all-inclusive that will work for kids of all ages, I recommend Blue Waters in Antigua. 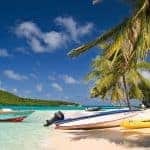 If you love to be on the water how about a sailing holiday in the British Virgin Islands, home to some of the finest beaches in the Caribbean. Stay at a fabulous barefoot hotel such as the Bitter End Yacht Club. Or head to California for a thrilling mix of beaches, national parks, iconic cities and theme parks. I particularly like this eight-night California Classic road trip from San Francisco to the theme parks of Anaheim, near Los Angeles. Increasing numbers of families are heading to Asia. You can find great family adventure holidays in Sri Lanka. This example includes a stay in a jungle eco-lodge, trekking, canoeing, white-water rafting and the gathering of elephants at Minneriya. Or explore Vietnam, taking an overnight junk cruise in Halong Bay and sleeping in luxury safari tents at Cat Tien National Park. Thailand is a wonderful destination for families with exciting cultural sights, great beaches and good food. This Southern Beach and Jungle Adventure, with elephant encounters, jungle treks and canoeing, works particularly well at Easter. See more family holidays in Thailand. In America, you can saddle up for a holiday on a real working ranch. Check out the Goosewing Ranch in Wyoming. Want to hit the open road? Try a motor home holiday in America. In South America, it’s the start of the dry season in the Galapagos Islands where this amazing 8-day Discover Galapagos tour includes all the bucket-list wildlife encounters. If it’s beaches you crave, head to Mauritius where Beachcomber Tours has free kids clubs at its resorts with lots of free sports, including water-skiing. Although warm weather is far from guaranteed, Easter can be a great time to explore the UK as a family. It’s a good time for self-catering, although a bit early in the year for camping. I recommend these family-friendly cottages in Cornwall and this collection of more than 200 dog-friendly cottages if you can’t bear to leave your pet at home. If you’re staying in a hotel, make sure it has plenty to keep the children amused. I like the Sands Resort Hotel and Gwel an Mor in Cornwall. The New Forest is a wonderful area for families with lots of gentle cycle paths, walking trails and other attractions. I love this collection of houses and cottages. Or hop on a ferry to the Isle of Wight where you’ll find some lovely self-catering cottages. On the island of Jersey, the Merton Hotel is one of the best family hotels in the UK with a weather-proof Aquadome (with pools, slides, fountains, sauna and steam room) and an outdoor pool complex, complete with a Flowrider where kids can learn to surf. You could always stay at home and pack the kids off to camp. Kingswood Camps runs 4, 5 and 7 night holidays over Easter at locations in Norfolk, Kent and North Wales, with confidence-building activities for ages 8 to 17. << Visit our homepage for 101 family holiday ideas. Also see my picks for the best family holidays in March and during February and May half-term weeks.